Prahlad, the Nepalese intern, confirms that these (Made in China) umbrellas are also sold in Kathmandu, Nepal – but!, Ahabwe – the intern from Uganda who’s come to join us for the next two months – brought this typical low-budget umbrella (I’ve so far only seen abroad, but never in Europe) from Cape Town (SA) the other day. That’s a lot of love for an umbrella that actually only costs EUR 2,40 (~ 30 ZAR) and isn’t available in Northern Europe (where the current weather suggests that umbrellas should be given out for free…). I guess that’s what happens when you’re responsible for a wife and a baby and have to save on just about everything. Actually, during the 18 months that I lived in Taipei, I “used up” about four of them – but EUR 2,40??? I didn’t spend that much. They were 60 NT$, which is around EUR 1,60. HAHAHA – you were ripped off!!! But seriously, those umbrellas were made almost entirely of Chinese plastic. I remember once, when I walked out of the building during the Taifun-season. The rain came sideways, and the wind was stronger than anything I had ever experienced during four years of living in northern Germany. I opened my umbrella, it went *PAFF*, and all I had left was a walking stick in my hand. The usual thing was that I just lost them. Normally, they have stands for umbrellas outside every shop, because the shopkeepers don’t like you to take the umbrella inside. So after I leave, I often tend to forget it. 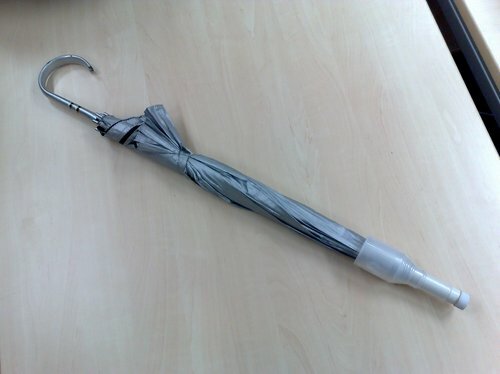 As for the covers: If you really do want to take your umbrella with you, for example into an office where you will be staying inside for a long time, you must take a cover. The security-guard at the door will give you one of these plastic “umbrella-condoms”, which you roll over. After you leave, you just take the plastic off, and throw it onto the ground, into the river, or into the flower-beds. At least, this is what I discovered from Chinese mentality. The insideo of the building has to be spotlessly clean, but what goes on outside is nobody’s responsibility. 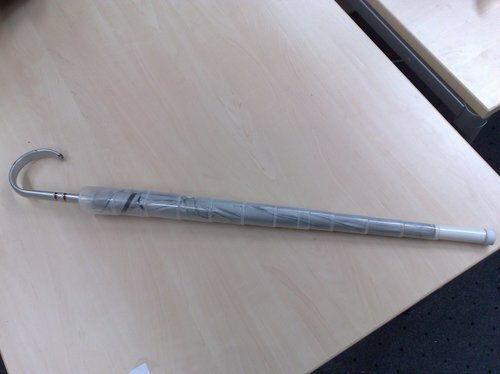 Since I never kept any of my umbrellas for long, it didn’t really matter that the quality was total rubbish. What is so disturbing is this throw-away-mentality in most countries. Everything is made out of plastic (because it’s cheap), and is thrown away after becoming useless. Oh yes, I bet they are even cheaper at the source. So the covers are given out for free? Mind you, the Chinese have a different relationship to plastics than we. It doesn’t have this sense of “cheap” and “rubbish” and “environmentally problematic” about it. In Taiwan, it is perfectly okay to have children’s toys, jewellery and even furniture made out of pvc, or to wear fashion of 100% polyester. People are very uncompromising about cleanliness within their own premises; for example, you may never wear shoes inside an appartment. It is also common to use one-way cutlery inside a restaurant – (plastic) cups, dishes and chop-sticks are not re-used, because of fear about hygiene (mind you, the rest of the place where you sit, like table, floor, toilets and kitchen may be totally appalling). Or the fact that people normally use plastic straws for all of their drinks, nobody would put their mouth on a can or a cup. Everything is one-way. On the other hand, whatever goes on OUTSIDE their own little premises, is nobody’s responsibility. Oil spilling out of a scooter-engine is no reason to be upset about. An entire highriser’s collection of waste may simply be dumped in a field next door. Factories blow their acid and smelly exhaust into the air, right next to a kindergarden. Buildings have zero isolation against heat or cold, yet the aircon is usually on full power all the time. If you walk through town, your eyes sometimes start tearing from the polluted air, yet the government has recently just announced the construction of several new coal-plants to meet the ever growing power demand. When you talk to Taiwanese colleagues about environmental protection, they are either amazed (never heard of it), or they tell you it is a “waste of money”. Chinese arrogance will then go on to let you know that, anyway, as a non-Taiwanese you know nothing about the Chinese world, so stay out of what is none of your business (packed in very friendly and courteous, yet unmisunderstandable sentences). So umbrella-covers just go in line with anything else. Made in Taiwan.